A sign of the crisis, recession or whatever you want to call the economic situation is sales everywhere. Press, private, online sales, big stores like Le Printemps, well I'm not going to complain especially when I read in the Sunday Times Why it's good to indulge the urge of splurge. I'm kind of love the guidelines of the "art of guilt-free shopping", well I've actually been doing it for years and that's the reason why I don't spend a lot. 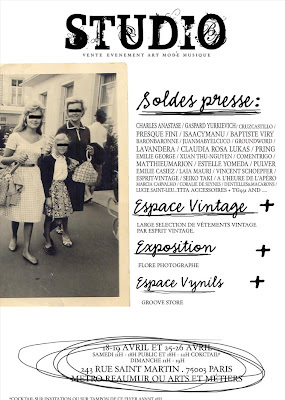 Past Sunday I went to take a look at this Press Sales, 30 designers like Estelle Yomeda, Pring Paris, Gaspard Yurkievich, TG931 or Charles Anastase (plus vintage) in the same place at the same time... and I will go back on Saturday. Time for a splurge? Passage obligé sans doute ? @ Mariga(z): je suis bien d'accord. Et vu la conjoncture comme on dit, ce n'est je crois que le début... Promis je vous le dirais, sans men sentir coupable! OMG! You have to splurge! Have lots of Fun Sole Shopping this Weekend!!! et vive le recession ! enfait voilà ça nous pousse plus à acheter quoi ...pareil pour moi en plus je suis à Londres c'est te dire ! ma mère me dit tout le temps que vivre là bas avec tous ces magasins autour de soi ( en plus les rois des soldes et bons plans ) c'est gouter à l'enfer ! @ Gerri Ward: I should have done it past sunday because I don't feel to splurge this week-end!